The USBDUP12 Standalone Flash Drive Duplicator/Eraser offers a quick and easy solution for cloning a USB flash drive to one or two target USB flash drives or erasing up to two thumb drives simultaneously without having to connect the drives to a computer system. Featuring high performance duplications at up to 1.5GB per minute, the flash drive copier has a lightweight design and user friendly interface that includes an integrated LCD display. The duplicator can copy the entire source drive volume, or for quicker backups just the data on the drive. In addition, the target USB ports of the duplicator also support connecting to external USB storage devices. 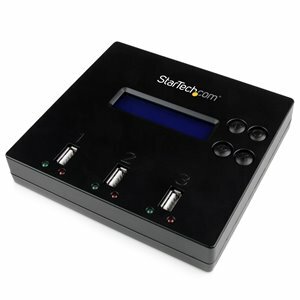 The standalone USB duplicator supports copying/cloning to SD/ SDHC/ Micro SD/ MMC/ Mini SD/ CF media through a USB multimedia card reader (sold separately), and to Hard Drives or Solid State Drives through a Hard Drive docking station or USB enclosure. The Drive Duplicator also functions as a Flash Drive Eraser capable of erasing up to two USB drives simultaneously with several erase modes available including Quick erase and Full erase, as well as Secure erase, which follows the USA Department of Defense (DoD) secure erase standard, passing over the flash drive 3 times to ensure that the data has been completely wiped.